My mom might have underestimated my love for veggies early on. 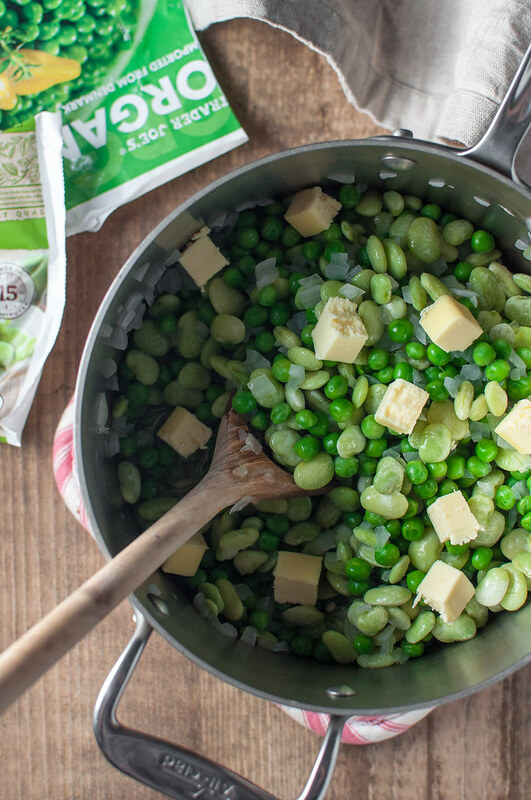 Sure, maybe she thought it a little strange to have a child who loved broccoli and peas, but she tended to cover them both (and more) in cheese. Definitely not opposed whatsoever to that strategy (I. love. cheese. ), but I’m thinking I would have been totally content with simple buttered peas or carrots or whatever the veggie du jour was that evening. 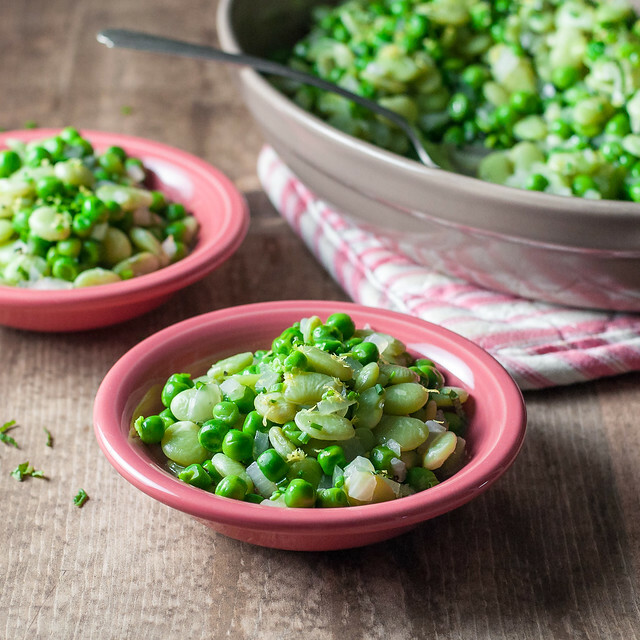 However, I’m quite sure my four-year-old mind would have been blown by these buttered peas and lima beans, prepared in just a few minutes, and accented with simple sweet onion, a touch of lemon zest, and whatever fresh herbs you have lying around. For springtime, and perhaps your upcoming easter celebrations, I was a big fan of the mint/chive combo I tested when photographing the recipe, but I’m also salivating right now, at 7:46 AM, over the thought of parsley and tender basil leaves. Or maybe all four? 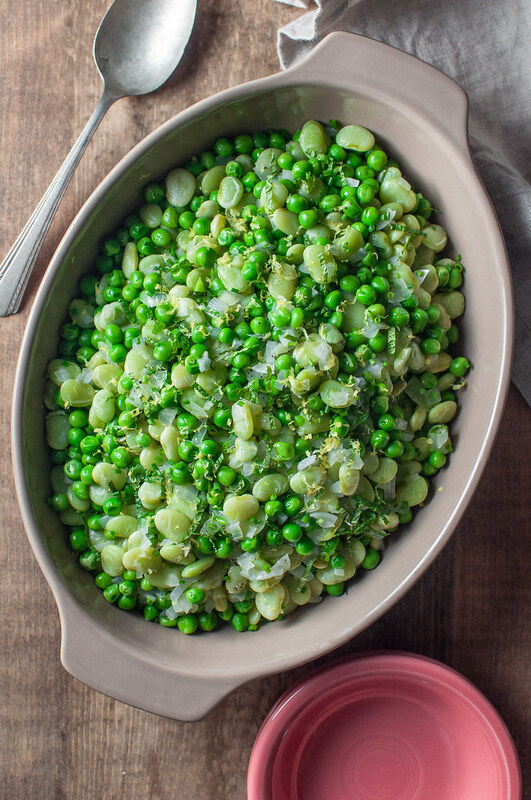 Regardless, this buttered peas side dish is really a cinch to prep, and if you’re traveling with it, it reheats well in a few minutes, just hold off on adding the zest and herbs until the end, if possible. 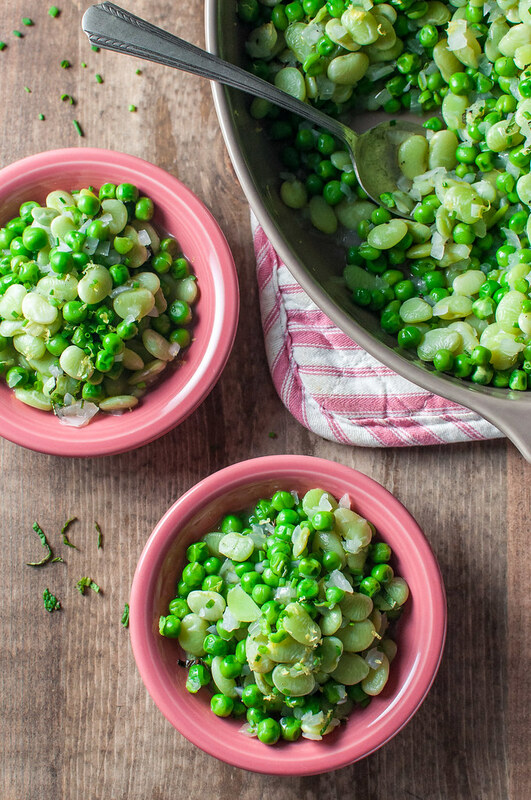 It might just be the prettiest and most popular green dish on the table. If you’re a regular reader, you’ve probably been thanking your lucky stars lately for some much shorter posts! Same pictures, fewer words. 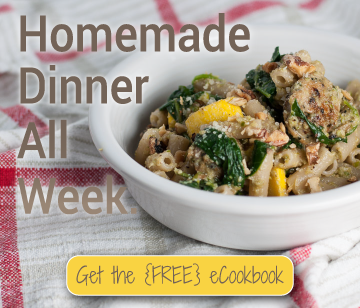 I’m not sure it’s permanent, but it’s the only way to bring you the full slate of recipes I have stored up without spending 26 hours a day working on the blog. I’m just barely getting a hold of some balance in puppy parenting, new house furnishing, socializing, and blogging. As much as I’m jealous of Molly and PW when she started out, I do not live in the middle of nowhere with 18 hours per day to cook and photograph and make NCK exactly how I want it. I also can definitely not afford any kind of assistant at this point, so it’s a one woman show over here, and I think that’s what a lot of newbies forget as we’re bombarded with excellent, but overwhelming, advice about growing our new food blog. I also count myself lucky to have frequent visitors, like my next-in-the-birth-order sister who is arriving TOMORROW NIGHT! Ahhhhhhhh!!! My favorite times of year are when she comes into town, or vice versa, and all three sissies are united once more. It’s just ridiculous to stress myself out about the blog when there’s so much fun stuff to do: happy hours, hiking, NYC trips, deck dinners, cooking, puppy playing, and most important, race spectating! Tristyn is running her first half marathon in grand style next Sunday, and it’s gonna be a blast (mostly for me because I don’t have to run 13.1 miles!). Tris has kicked booty in fundraising department, but for anyone who knows her (or doesn’t) and hasn’t yet checked out the fundraising page–DO IT! No pressure. It’s for a good cause. Meanwhile, I’ll be in touch with regular but abbreviated posts, but the recipes will still be awesome! You can always find me via Instagram and Twitter, and I’ll be responding to blog post comments often! 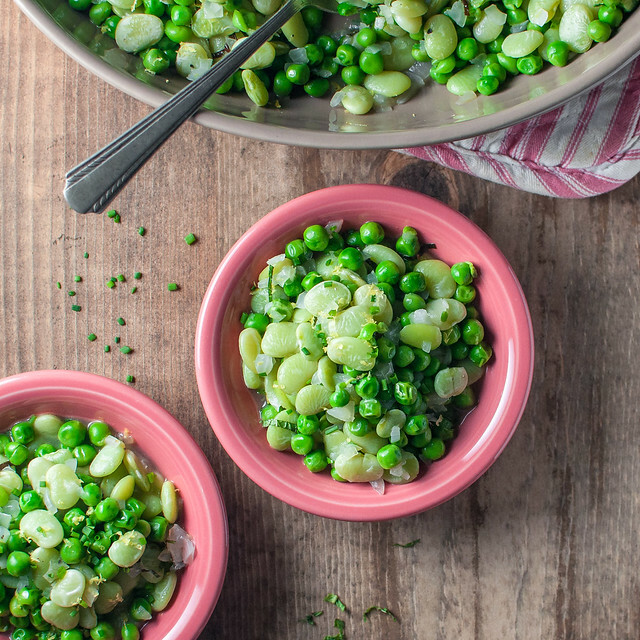 Basic buttered peas get a party-worth spring makeover: sweet onion, bright lemon zest, and whatever fresh herbs you have on hand. Plus lots of pretty pastel lima beans! Bring water, onion, and 1 teaspoon salt to a boil over high heat in a medium saucepan. Cover and reduce heat to medium low, simmering about 5 minutes, until onion is tender. 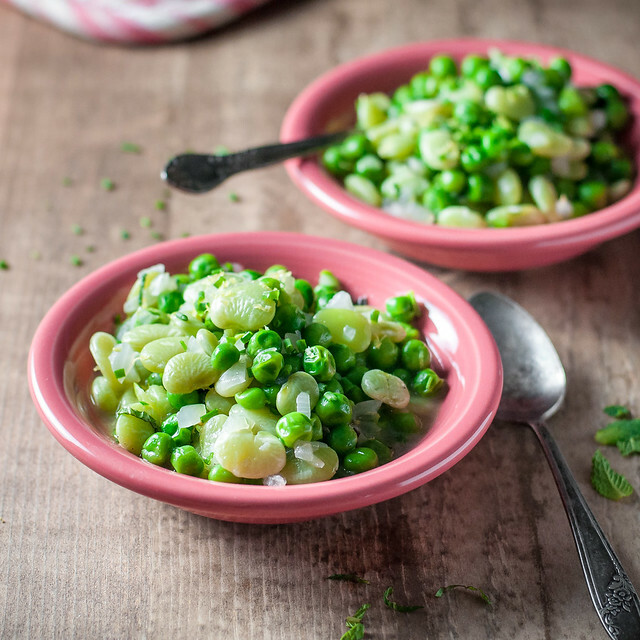 Stir in butter, peas, and lima beans and increase heat to medium high. Cover and cook 5 to 8 minutes, stirring occasionally, until peas and beans are tender and butter is melted. Off heat, stir in lemon zest and herbs, plus salt and pepper to taste. 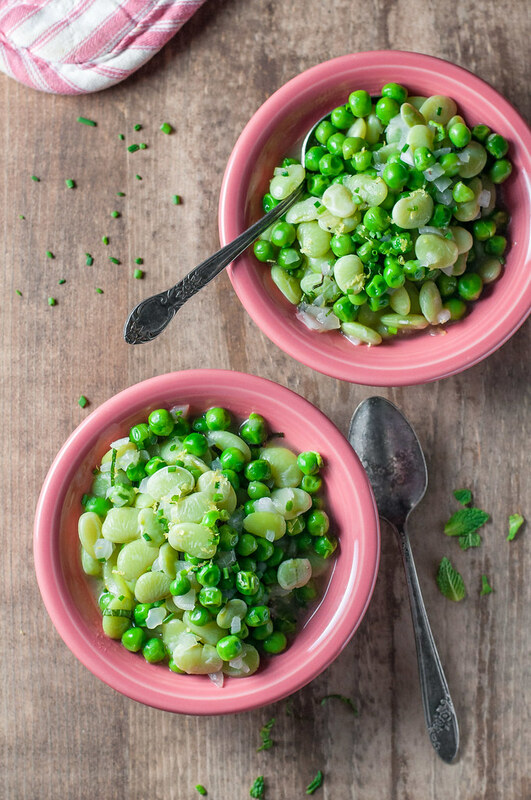 The peas and beans are most delicious served with their liquid. Adapted from Gourmet Comfort special edition magazine. Mint is delicious here, but note that it turns black when wet. If using, for the best presentation, add to the dish just before serving. The side dish does well made a day ahead. 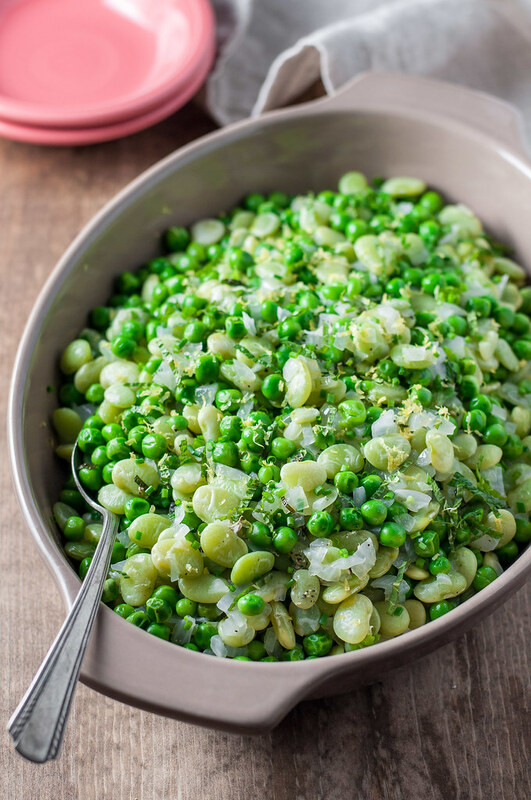 Keep extra liquid with the peas and limas, and reheat in a low oven or microwave, stirring occasionally, covered with foil or plastic wrap, respectively. Note: This page contains affiliate links. It does NOT contain sponsored content. Affiliate links (to products I recommend, on Amazon) offset my ingredient and website maintenance costs, so I can keep bringing you Spring recipes like this one. Thanks! so green, spring-y and beautiful! makes me envious that we have just gone into autumn here in australia. Thalia, it might still be possible since I use frozen veg! Would just need to change up the herbs for a cool weather version.